Hello all and let me introduce myself. I’m James, a relatively new setter/ solver to the Listener world, and I will, on-and-off, be a new blogger for LWO. Regular readers will have seen me pop up three times already with guest blogs, with a worked solution for last year’s card puzzle by gwizardry (Killer Queen, Listener 4242) and then a couple of weeks later I covered for Shirley when her own fine puzzle At Spes Non Fracta, Listener 4244, was up that week; and most recently I provided a full solution path for Zag’s remarkable logic puzzle Codebreaker, Listener 4295. But now it’s official that I will providing semi-regular blogs as a new member of the LWO team. A bit more about me, then: I first came to Listeners in 2010 with a pair of numerical puzzles, but it was only in 2011 that I finally started to tackle the regular puzzles, starting with Mr Lemon’s Inn Joke, Listener 4152. Somewhat luckily I managed to win the prize three puzzles later, and since then I’ve started to work my way up to being able to solve most puzzles, scraping into the official stats for 2013 with 42 correct out of 48 submitted (could have been 44, I think, but somehow a couple got lost in the post – oh well!). Hopefully 2014 will be even better still. I also attempt the puzzles in the Magpie and the EV, and in 2013 also managed to have a couple of my own puzzles published in the EV series under my pseudonym of “Jaguar” — more are to follow! But enough about me, now, and on to this puzzle. Aramis seems to be a new setter, or at least a new pseudonym, but as I read the preamble it became clear that he (or she — or they?) hadn’t held back from creativity or difficulty for their debut. Tetris pieces filling the whole grid? Across clues that were either one or two words? Misprints, sometimes two per clue?! 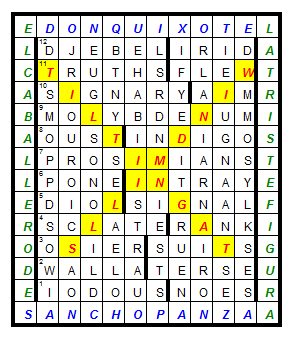 All that, and a perimeter quotation and something to be highlighted afterwards… This was going to be tough indeed, especially as it was fairly obvious that I’d need to cold-solve quite a lot of clues — both from the twelve acrosses, which could at least be entered, and from the Tetris bricks that I would need for the perimeter. There might be a lot of fiddling to work out what went where. Yes, this was going to be seriously tough. Still, I suppose that I had best get started. 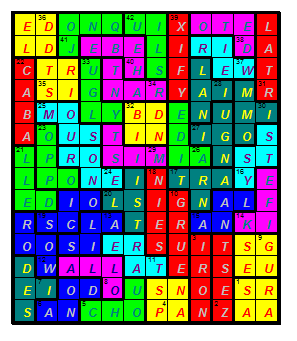 After some time (I don’t keep track) I’d managed to solve the 3rd, 10th and 11th rows and had fitted my first tile in as WEIR (writes*-T,S; maZy); but most of the Shape clues I had solved were going to go at the bottom or middle of the grid where I had so little to go on. I had some hint that ZEST (Z + EST; spIce) was probably going to join the T of SUITS … which of course left me wondering who could possibly have a name, or soubriquet, or sidekick with a Z? Things got even more obtuse when I found SAAR (SA +A+ R; roOk — by the way, it = SA is one of those bits of crossword trickery I can never decide if I love or hate. I mean, who looks at “it” as anything other than an innocent word?) and was trying to think of ZAR or ZAA or ZRA, etc. patterns in names, and getting nowhere. That took me into Friday night and it was only early on Saturday morning that I finally cracked the third shape clue. Lovely = Lively had occurred to me already so I was looking for an anagram of some sort but it took a while to eke out IRON PANS ([[O]rpingtons -gt. +a]*, lIvely, fOr), and with the help of NOES (“nose”) I started trying to sort out what was going on around the Z. First try: IRON in a circle and PANS lying flat alongside, for SIR ZA… Sir who? Never heard of him. This is still not looking promising. It was only when I found the place for GRUE that I realised that this wasn’t right, and instead IRON was the long thin shape, and the bottom would read PANZAA… Sancho Panza! At last! Well, that’s a real name isn’t it? Although I’m only familiar with it from some sketch in Monty Python’s Flying Circus so I needed Google to confirm his origin in the Don Quixote story. So anyway, that was the breakthrough I needed, although it took a bit of a while for the rest of the perimeter to make sense. To sort that out I needed to turn to the Spanish version of Wikipedia to provide the soubriquet “El Caballero de la Triste Figura” which roughly translated means “the Knight who cries a lot”, I think. It still took some time to complete! There was a lot of fiddling to get the bricks in the right places, especially for the IMMORTAL clue that I’d solved early on but initially had thought would be in a completely different arrangement, and having words such as STRIDDLE, JONQUILS, HEBE and DJEBEL to sort out in the top left didn’t help much either. Never mind. Eventually the final, and remarkably colourful, grid came out and it didn’t take too long to find the phrase to be highlighted. This entry was posted on 27 June 2014 at 4:01 pm	and is filed under Solving Blogs. Tagged: Aramis, Don Quixote, Tetris. You can follow any responses to this entry through the RSS 2.0 feed. You can leave a response, or trackback from your own site. Great blog, and thank you for joining a team that consistently gives us such fun Friday night commentary!